We use our umbrellas indiscriminately unlike in the olden age when they had a separate umbrella for rain and sun. But vintage or not, umbrellas generally encounter the same problems. Truly vintage ones are generally made of linen, silk, wool and cotton. Modern reproduction of retro umbrellas and regular ones are generally made of waterproof polyester. The most common umbrella issue is the spokes and its skeletal structure. 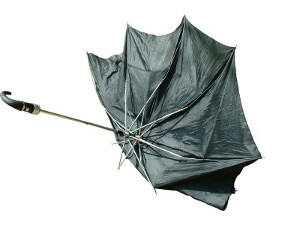 With modern umbrellas, this typically happens when your umbrella catches a strong wind gust that causes it to get blown inside out in the opposite direction. At the same time, you don't really use your vintage umbrella during a huge storm because it would not survive, so this fault can be caused by its antiquity. In this case, you can end up with broken spokes or structure. A broken spoke in your umbrella can be repaired by soldering the spoke's ends together in the place of breakage and clamping it with a piece of tin. If the spokes are covered with galvanic plating, it should be removed beforehand from the soldered place with a fine file or sandpaper. In the worst case, broken spokes in your umbrella can entail some rewiring. It might seem to be a Herculean task, but it's definitely achievable with enough caution. Of course, you need to be careful in dealing with the intricacies of an antique umbrella, as you wouldn't want it to turn out looking like something out of a junkyard. Besides the ribs themselves, your umbrella may need fixing or replacing the rib tips – sometimes they come as separate parts made of wood or plastic that may crack with time. However, these parts are often available just as wholesale lots in online marketplaces, and you can't know for sure that they will fit the ribs you are trying to fix. Actually, some DIY techniques exist for making spoke end caps yourself – materials like glue bar or some others can be used for that. Yet, as an easier and neater alternative, you might want to check first if you can find some other old broken umbrella you no longer need. In case its rib tips fit well and look natural as the replacements, you can use them for all the rest of spokes to make them look uniformly. A faulty stem is actually quite a rare problem, as it's usually the strongest part of the umbrella. However, if the shaft is faulty, you can try to reinforce it to be able to support the umbrella structure. A clean break requires putting the two pieces back together using some quality adhesive. It has to be at least water-resistant; otherwise it won't do any good. The strengthening effect can be increased by using the tape as well, though this may look not that aesthetic. At the same time, if you want a seamless repair with less hustle, you can try to seek out a professional to do this for you. A tear in the canopy is uncommon with modern umbrellas since present-day reproductions of vintage ones and contemporary umbrellas are made from polyester that makes them less susceptible to tear. However, this is a common problem for traditional vintage items since they are made from fragile materials like cotton, linen, silk and wool. A simple small tear can easily be remedied by sewing the fabrics together. Again, if a big chunk of the fabric is torn, it would be better to seek out a professional who is better equipped to fix it and may even have the same fabric to make it all come together flawlessly. Also, take in account that not every kind of fabric can be sewed. For example, some synthetic fabrics should be welded instead with a low power soldering iron using the smooth heat resistant layer. Ideally, it is best to consult a professional for repairs due to the delicate nature of vintage umbrellas. There may not be a lot of them left but there are still a few who specialize in repairing those elegant old fashioned items. Vintage umbrellas are beautiful historical artifacts that we should try to preserve as long as possible.